Causes of high blood pressure include the following factors: age, weight, family medical history, stress level, consumption of nicotine, alcohol intake, sodium and potassium levels, and physical activity. High blood pressure can be a symptom of kidney disease, and can also indicate hormonal disorders or imbalances in the thyroid and adrenal glands. Taking control of high blood pressure in its early stages can greatly reduce the risk of heart attack, stroke, kidney disease, brain hemorrhage, and vision loss. Indigenous to central Asia, garlic is has a history of use as a remedy for conditions such as smallpox and tuberculosis. A common ingredient in traditional dishes of various cultures, garlic has received scientific interest in recent years regarding its potential to prevent and reduce high blood pressure. A number of in vivo studies have resulted in data that suggests a relationship between garlic and cardiovascular health. Results from clinical trials indicate that treatment with garlic may cause significant reductions in both systolic and diastolic blood pressure. Other studies suggest that garlic may reduce the risk of blood clots. Not technically a herb, of course, but carrots can be utilized for their health benefits, so we included them! Best known health-wise for its beta-carotene content, carrot is a powerful vegetable fortified with various health nutrients that are very beneficial for the body. Today, it is considered as one of the best naturally beneficial vegetables to take for people suffering from high blood pressure. For thousands of years, Chinese hawthorn has been used by different cultures and societies in treating and managing high blood pressure. Many clinical trials have proven the claim on Chinese hawthorn’s effectiveness in dealing with hypertension. According to research, this herb is rich with two highly potent antioxidant agents, oligomeric procyanidins and flavonoids, which are definitely good for the heart. Ginger works by lowering the level of bad cholesterol in the body which when left uncontrolled, can lead to the formation of plaques along the walls of arteries. 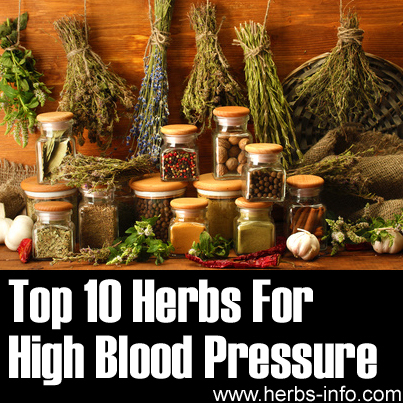 It may create blockages in arteries and blood vessels which can greatly affect blood pressure. These plaques may also affect the elasticity of the arteries which can result to higher blood pressure. Believed to have originated from Egypt, flaxseed also makes a great herb for high blood pressure. It contains high levels of α-linolenic acid, a type of essential fatty acid, which is believed to be beneficial in the prevention, treatment and management of arthritis, inflammatory bowel disease and of course, hypertension.